Sunday March 13 1910 I felt much better today. I was busy about the house most of the forenoon and read and wrote some. We went to bed early. 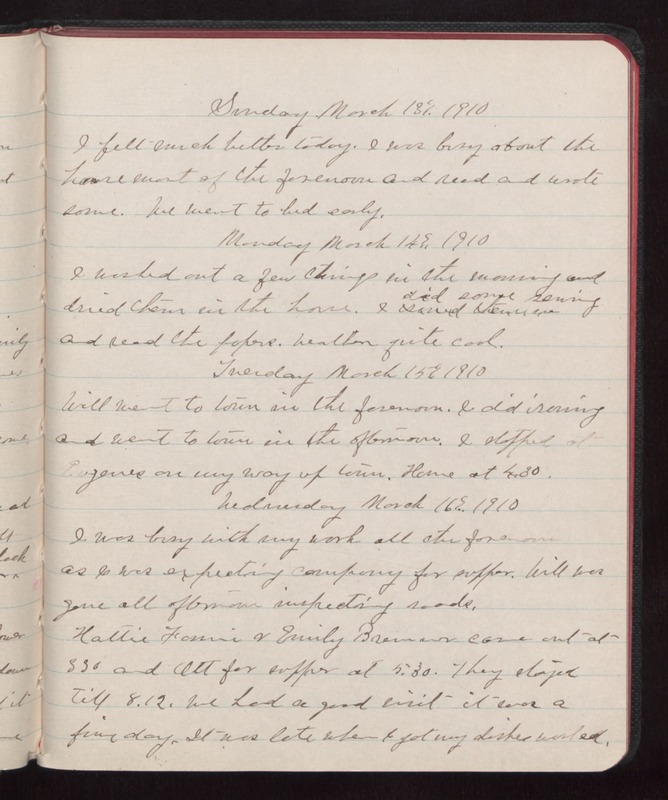 Monday March 14 1910 I washed out a few things in the morning and dried them in the house. I did some sewing and read the papers. Weather quite cool. Tuesday March 15 1910 Will went to town in the forenoon. I did ironing and went to town in the afternoon. I stopped at Eugenes on my way up town. Home at 4.30. Wednesday March 16 1910 I was busy with my work all the forenoon as I was expecting company for supper. Will was gone all afternoon inspecting roads. Hattie Fannie and Emily [Breimar?] came out at 3.30 and Ott for supper at 5.30. They stayed till 8.12. We had a good visit it was a fine day. It was late when I got my dishes washed.